Chocolate in savoury dishes is quite common in Mexico and other South American countries. The chocolate gives a rich mouth-feel and adds depth of flavour. This is a simplified version that was created to highlight Oxfam GBs range of Fairtrade products, including chocolate. Peel and chop the onion quite small. Chop the red bell pepper into 1cm (half inch) squares. Mince the garlic and chop the chillies quite finely - de-seed them if you don't like too much heat. Save some of the chilli bits for garnish later. Cut the chicken into cubes. Add a good glug of oil to a frying pan on medium heat. Break the cinnamon stick in half and add it to the oil with the cumin seeds, Give them a stir and cook for a few minutes until they start to release their aroma. Add the onion and cook gently for about 5 minutes until they are soft but not brown. Add the chicken and stir until they are sealed all over. Add the bell pepper, garlic and chillies and cook for a couple of minutes, then add the stock. Stir everything together and simmer for 10 minutes. Taste the sauce and adjust seasoning if necessary. Now break the chocolate up into squares, add to the sauce and stir until melted. Serve with rice or flatbread. The video above is from the Keef Cooks YouTube channel. 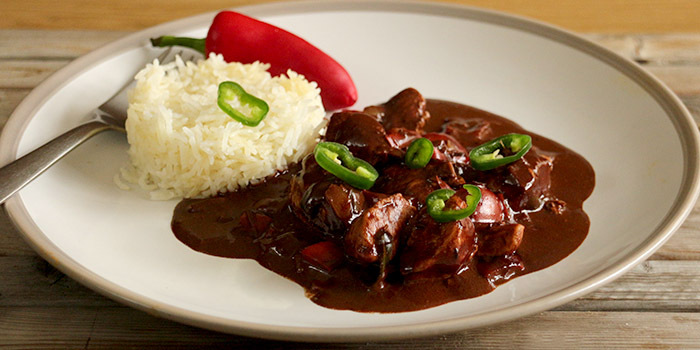 Click here to see the video recipe of Chilli Chocolate Chicken on YouTube.